If your home has a waterfront view, you need to be making the most of it. 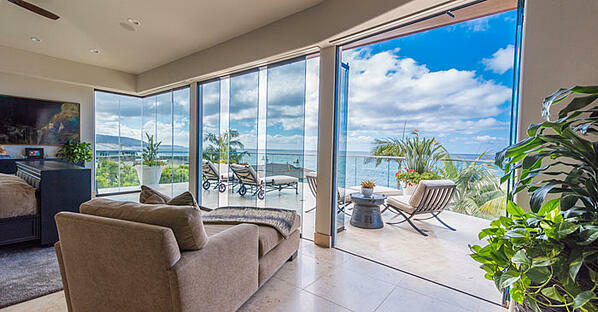 A window is good, frameless glass is better, but a frameless sliding glass wall is best of all. With a sliding system from Cover Glass, you can create a seamless connection between your home and waterfront. 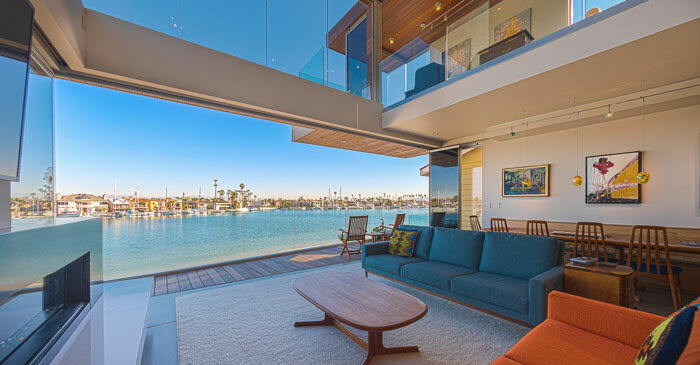 If you need any more convincing, check out these Southern California waterfront views, all of which are possible thanks to Cover Glass. A large deck allows this home to take advantage of the view from the outdoors, but this home is also in the perfect position to have amazing views from indoors. To fully benefit from this opportunity, the homeowners decided to create frameless waterfront views by turning one complete wall and part of another into sliding glass doors. In the picture, you’ll see that some of the panels are opened to form air gaps — and that this takes nothing away from the waterfront views. Plus, you can see how that when the glass wall is open completely, there is almost no distinction between the living room and the deck. This is emphasized by the recessed lower tracks, which are only possible with a top-hung system like Cover Glass. The shape of the glass wall along with the contrast of the flooring of the interior and the deck helps create the illusion that the waterfront view is a picture. Indeed, it is picture perfect, but this is far better than any painting on the wall, as the homeowners are able to live it. Furthermore, the larger glass wall is combined with a smaller opening, giving the homeowners greater flexibility for using the space. This home took the Cover Glass system to another level — literally. The upper and lower floors both feature glass walls that maximize the frameless glass waterfront views. The lack of ceiling between the two floors only enhances this. Plus, the home still manages to maintain a closed floor plan upstairs without reducing the views, thanks to an additional glass wall. The photo also demonstrates just how important it is to opt for a frameless system. There are no distractions and nothing to take away from the stunning appearance, allowing visitors to feel like part of the landscape. This final example uses more traditional decor — and shows how glass walls are just as effective. In fact, it would be hard to imagine this home with anything but a sliding glass system. The homeowners also chose to create a greater contrast between the interior and exterior through their choice of flooring. The sliding glass doors maintain this transition, but make it easier to move from one space to the other. These four examples are vastly different to one another. 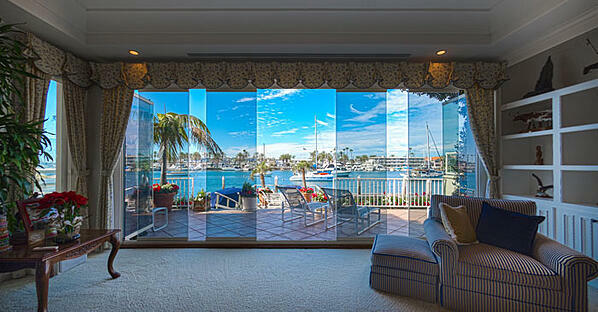 This highlights how distinct waterfront views, architecture, and home styles all benefit from a Cover Glass system. It also emphasizes why choosing frameless glass with various opening combinations provides you with numerous additional benefits.